The best way I know how to start this is to say it takes a really special person to raise and love a child as their own. Growing up I always wanted a dad, and not just one that called on my birthday, but one that would be there all the time. My mom met the man I call my dad when I was about 10, and that’s when I got the best dad any girl could ask for. I can’t possibly tell you how grateful I am for all my dad has done for me over the years, because I wouldn’t even know where to begin. I can tell you that it’s the simple, everyday things that truly make a dad. He always asked me all about my day every night at the dinner table. He picked me up from school, took me to the doctor, was at every graduation, and went to all my dance competitions. He taught me the importance of working hard, how to save money, and how to check the oil in my car. One particular time that always stands out in my mind is how he remained completely calm the day I announced that I wasn’t going back to school, and that I wanted to go to culinary school and become a Pastry Chef. By the way, I’m really happy that one worked out well! These may seem like simple things, but what most people forget is that it’s not just about being there, it’s about being present. There are two things that really stand out to me about my dad. The first is how he’s always happy. This one is really hard for me to wrap my head around because I’m definitely not always happy, and I don’t know many people who are! Somehow the man is always calm, and always in a good mood. Even if he doesn’t agree with someone’s choices or decisions, if they’re happy, then he’s genuinely happy for them. The second is his kindness and generosity. He believes that people are good, and helps anyone in need. When he does help people, he does it selflessly. He never expects anything in return, and in fact you’ll never even hear him talk about what he’s done. It truly brings him joy to help others. So does biology have anything to do with being a father? I don’t think so. A father sets an example for what a man should be. My dad is a man of integrity, he is dependable and a man of his word. I don’t think there is a better example than that. Thanks Dad. >Lovely tribute 🙂 Great cookies as well. Nothing better than a boozy dessert. Well done! >Your dad sounds like an awesome guy! He definetely deserves these cookies….Happy Fathers day to him. >Delicious looking cookies… and such beautiful words about your dad! >These cookies look delicious. I will bookmark this recipe for a future reference. Thanks! >What a lovely and loving tribute to your dad. He sounds amazing. Great bourbon kick to these gorgeous cookies. >What a beautiful tribute to your dad! And your cookies look wonderful! I hope you and your dad both have a great day! >What a lovely post to your Dad. You are lucky to have each other! These cookies are so simply pretty. What a beautiful gesture for father's day! >This was such a sweet post about your Dad. It just goes to show that anyone can produce a child but it really takes something special to be a Father or Mother. The cookies look delicious. I bet my Dad would love them! >These sound great! I've never heard of a cookie with bourbon in it but I love the creativity, I'm sure it tastes rich and wonderful! >Delicious looking cookies and nice post about your dad. I know he will enjoy Father's Day, especially with these treats. >Yes, father is the first man in our life and he holds a supreme place of respect and love in his child's heart! Happy Father's day! The cookies go perfectly well on my celebration of this special day! Great recipe!! >What a beautiful tribute to your dad, Meghan! The cookies looks absolutely delicious and pretty. Today is a very special day to celebrate all the great dads that has made a huge difference in our lives. >What a sweet post. The cookies look delicious. I love the bourbon you used in them. >Sweet post and lovely cookies! >Your post is so beautiful and heartfelt. I hope he enjoyed your cookies and his day very much. >What a nice Dad and a yummy recipe. I love using vanilla paste it adds so much depth to the flavor. >You're so sweet about your dad. Lovely post. 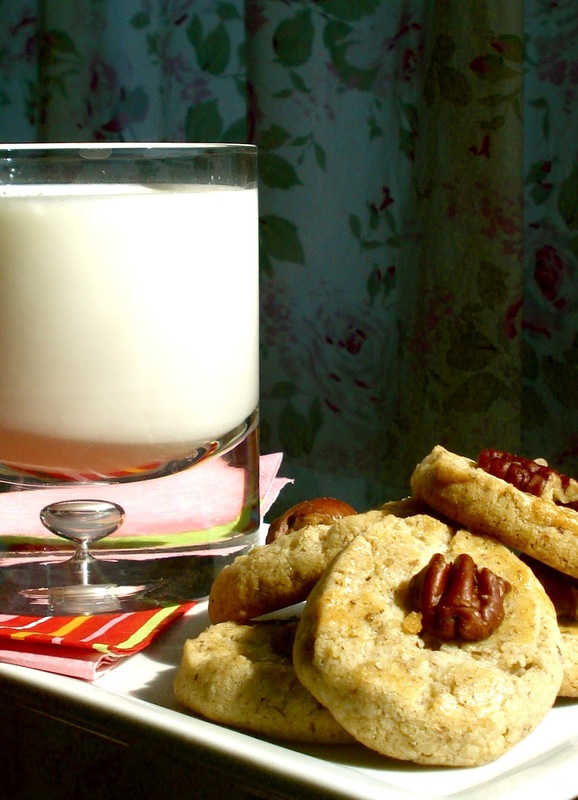 And fab cookies, I adore anything with pecans. >What a great post about your Dad!! These cookies look delicious as well! >These look YUM!!! And I'm not a huge fan of pecans…but I'll try these! >This was such a beautiful tribute to your dad– he sounds like a very special man! These cookies look and sound absolutely delicious! I love how they're topped with a pecan half! I would love some right now! >He sounds like a truly wonderful person. I loved the bit about not just being there, but being present. So truthful. And the cookies sound SO good!